Did you know that children smile as many as 400 times every day? Of course, children are too busy exploring the exciting world around them to worry about what kind of an impression their smile makes. For us adults, on the other hand, insecurity about our crooked teeth may mean that we suppress smiles or cover our mouths. This may be especially true for people who have gaps between their teeth. Luckily, there is a solution for this unsightly sort of smile. Read on to learn answers to the most frequently asked questions about Invisalign. You will also learn about how Invisalign before and after gap treatment can make you want to flash those pearly whites once again. Invisalign Clear Aligners are a fantastic alternative to traditional metal braces. As the name implies, they are invisible. These aligners are also comfortable and removable. Rather than having the hardware attached directly to your teeth, as with traditional metal braces, the Invisalign method involves uses clear plastic trays that snap onto your teeth. In fact, Invisalign was first dreamed up by an adult orthodontic patient Zia Chishti. After being fitted for a retainer, Chishti wondered if the desired outcome of straight, even teeth could be effected through a series of small movements provided by clear aligners. Approved by the FDA in 1998, Invisalign became available to patients in 1999. Since then, the clear orthodontic system has helped over three million people achieve the smile of their dreams. The process begins with a digital 3-D laser scan of your mouth. This, along with panoramic X-rays and other photos, enables the orthodontist to create custom aligners. These aligners are worn for approximately 22 hours out of the day. They should be removed only when you eat, brush your teeth, or floss your teeth. But because Invisalign Clear Aligners are so difficult to detect when they are in place, patients do not suffer any embarrassment. That certainly isn't the case when a patient has metal braces. The other huge benefit to Invisalign? Most patients can achieve even, straight teeth in half the time that metal braces would require! 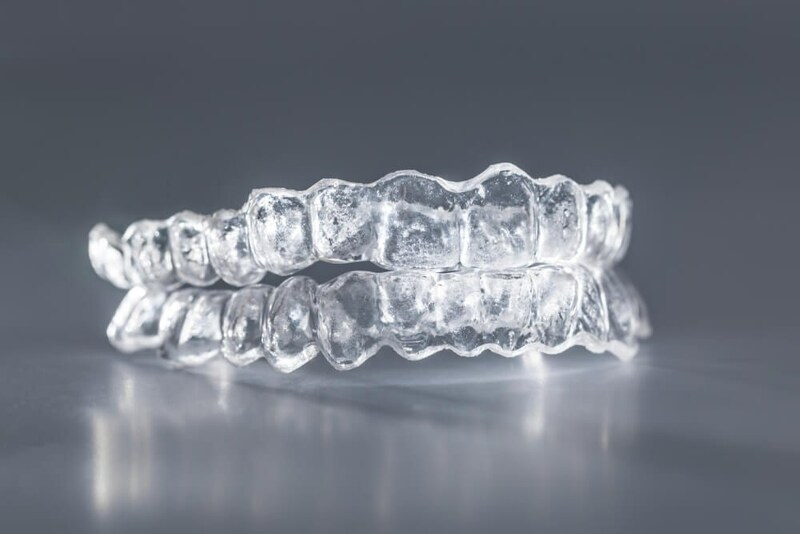 Invisalign Clear Aligners aren't just for teenagers. Any patient, of any age, can benefit from the straightening effect they can provide. They work particularly well on patients who have crooked, crowded lower front teeth. But that's not to say that Invisalign isn't also a great option for people with gaps between their teeth! Invisalign works well for anyone who has widely spaced teeth, an underbite, an overbite, or a crossbite. In fact, just about anyone who has experienced uneven or unsightly teeth, anywhere in the mouth, can benefit from Invisalign. Invisalign Clear Aligners Are Just for Cosmetic Purposes, Right? Wrong! Although it's difficult to underestimate the effect of straight, even teeth, the truth is that Invisalign can also help your mouth become more healthy. That's because when teeth are crooked, crowded, and overlapping one another, it's hard to get them clean. It's difficult to get between the teeth with a toothbrush or even with floss, to clean out the harmful bacteria. When you can't easily brush and floss, bacteria builds UP. Which can lead to halitosis, which is an unpleasant condition to live with. Even more dangerous, however, is the possibility of developing gingivitis and periodontitis, or gum disease. Periodontitis isn't just a problem that is limited to your mouth, either. In fact, periodontitis has been conclusively linked to heart disease and stroke. So you aren't selfish or shallow to undergo teeth straightening with Invisalign. You are taking steps to improve your overall health and to lessen the odds of being diagnosed with heart disease. The length of time that you will spend wearing Invisalign Clear Aligners depends, naturally, on the extent of the dental issues you are trying to treat. However, most patients are able to complete a course of treatment with Invisalign in between four to eight months. During that time, you will be asked to wear the aligners at all times, even while you sleep. The only time you should remove them is while you are eating meals or snacks, and while you are brushing and flossing your teeth. You will receive a new aligner approximately every week, with each new aligner bringing you closer to your ideal smile! To properly maintain the alignment of your teeth, you should expect to wear a custom-made nighttime retainer. This will help maintain your even, straight, beautiful smile. What About Invisalign Before and After Gap? There is a misconception that patients who have gaps between their teeth aren't good candidates for Invisalign, but nothing could be further than the truth! Invisalign works on a wide variety of dental problems. Gaps between the teeth are often embarrassing, and if there are wide gaps, or a number of teeth missing, they can also lead to trouble while eating. Invisalign uses the gentle force of clear aligner trays to move your teeth into position, and in this case, to eliminate those unsightly and embarrassing gaps. Don't just take our word for it, however. Check out the Invisalign before and after gap pictures to see the remarkable transformations we've made to our patients' smiles! Ready To See Results and Smile Again? Contact the friendly, compassionate, and professional staff at Dallas Laser Dentistry. We provide comprehensive dental care for the whole family, in addition to a range of cosmetic dental procedures to help you look and feel your best. If your teeth could use an overhaul, be sure to ask us about our Smile Makeover program. Invisalign before and after gap treatment is commonly the first step in the makeover process. Once your teeth are straight and even, we can work on making them whiter and brighter, as well! Request a complimentary consultation today, and pretty soon you will definitely have something to smile about!